Towards Comprehensive Injury Surveillance in Africa: the Cape Town Trauma Registry. Vanessa Fawcett. Identifying Barriers to the Effective Treatment of Chronic Middle Ear. Paul Mick. Identifying the Barriers to the Early Diagnosis and Treatment of Oral Cancer in Uganda. Danielle MacNeil. The Status of Trauma Quality Improvement Program (TQIP) in Low- and Middle-Income Countries: a Systematic Review of the Literature and the Development of Future Strategies for Surveillance. Zaheer Kanji. Coaching Surgical Trainees in Africa: a feasibility study using video replay to maximize short-term training opportunities. Monica Langer. Prevalence and Risk Factors of Fungal Colonization and Infection in Burn. Gareth Eeson. Mental Practice in Surgical education: A Pilot Study using an Otologic Surgery Model in Uganda. Anali Dadgostar. An Evaluation of Surgical Care in the North Gondar Zone of Ethiopia: Documenting Delivery, Evaluating Essential Surgical Skills Courses as Training Tools, and Identifying Barriers to Surgical Care. Dan Jenkin. Distribution and determinants of injury in Cape Town, South Africa: A prospective cohort study using an injury surveillance tool. Eiman Zargaran. Endemic Thyroid Goiters in the Rural Philippines: Prognostic Indicators for Improvement in Health-Related Quality of Life Post-Thyroidectomy. Kristelle Chueng. Validity Testing a Lo-Fidelity Simulator for Ear Surgery in a Low-Resource Setting. Kimberly Luu. 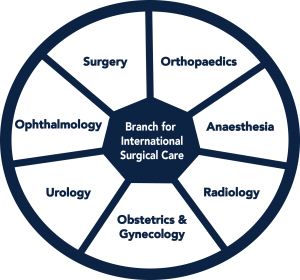 Development of a centre-specific head and neck microvascular surgery clinical care pathway in Mongolia. Oleksandr Butskiy. Development and Evaluation of a Wireless Pulse Oximeter on a Cell Phone (iPleth) for Safe Perioperative Care in Uganda. Jacqueline Hudson. A Mobile Diagnostic and Advisory Device for Management of Children with Sepsis in Developing Countries. Sean McLean. Medical devices for diagnosis and management of orthopaedic trauma: a needs assessment study of orthopaedic services in Uganda. Lise Leveille. Clinical outcomes for open tibial shaft fractures: A prospective randomized trial comparing external fixation to unreamed intramedullary nailing in Uganda. David Stockton. The ASPIRE Project: Advances in Screening and Prevention in Reproductive Cancers. Flora Teng. Determining an optimal cervical cancer screening paradigm in a low-resource setting: A community-based randomized controlled trial comparing self-collected HPV testing with visual inspection and acetic acid (VIA) screening in Kampala, Uganda. Sheona Mitchell. Corneal Transplantation in India: Indications, Outcomes, and Impact on Eye Banking. Sonia Yeung.